Recognize, Act, and Preserve (RAP). 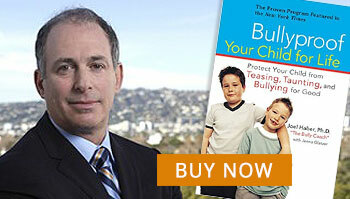 Bullying is meant to humiliate, and it does its job quite well. Often, bullied kids are so embarrassed that they don’t even want to tell their parents. They may be afraid that the parent will tell them never to speak to a bullying kid again, think less of them, that the parent will side with the bullies, make light of the problem, take action that will humiliate them further, or worse: not believe them. So how can you find out what’s going on? Before we can tackle the bullying problem, you’ll need to recognize the problem and find out exactly what’s happening. The real challenge parents face in the crisis phase—and unfortunately, events are likely to unfold in this manner—comes when your child, out of shame, guilt, fear, or some combination of all three, doesn’t share with you what’s been going on until the crisis is so acute she feels completely overwhelmed. At this point, the way you react can have a big impact. 1. Read cues to initiate a talk. Choosing the right time for heart-to-heart conversations is crucial. The time to talk to your child about bullying behaviors is not when he’s watching his favorite television show, playing a video game, or trying to go to sleep. Ideally, you’ll know it’s the right time to talk because the child comes to you and tells you about the problem. This is more common with younger kids, but even then, it doesn’t always happen. Don’t jump to take it personally if a child doesn’t talk to you about these kinds of problems. It may have something to do with how you’ve reacted to other problems in the past, or it may have nothing to do with you—it could just be that the child is embarrassed, wants to pretend it never happened, wants to figure out how to deal with it on his own, is too upset to talk about it right now, or any number of other reasons. If the child is just sitting around looking glum, that’s a time to approach. If confidentiality isn’t an issue (no other siblings at the table), during dinner might be an okay time. In the car while driving home from school or an activity is an ideal time. If you don’t seem to have a perfect time built in, make one. Ask the child to help you with dinner preparation, or setting the table. Ask the child to come with you to pick up dessert. 2. Help the child open up. Did you learn anything interesting today? What did you do in recess today? Did you hear about. . . that I heard on the radio or saw on TV today? Did you do anything fun with your friends today? You can ease your way into the tougher questions, but begin by letting the child see that you are engaged, interested, and ready to listen before jumping into “risky” territory. Then you can ask about bullying experiences. If the child says, “I don’t want to talk about it,” respect that and ask the child to come back to you when he is ready. If he doesn’t come back to talk about it, try again after a meal, or the following day. Don’t get threatening or angry about the reluctance to talk. Forcing a child to talk is going to backfire, simple as that. Don’t react with alarm, anger, or overt anxiety. Don’t appear upset or fearful. This will push your child’s sense of crisis into overdrive. You are a very tall person with a lot of power in that child’s mind. Your main job right now is to look sympathetic and listen. Keep your intense emotions to yourself or wait until you calm down. Take a couple of deep breaths until you feel at ease. If you open up conversation with lots of intensity, you can expect to get back lots of intensity. It’s tough enough for your child to open up without having to worry about your reaction. CHILD: This kid named Bobby kicked me on the bus today, and I fell down and dropped my notebook, so his friend picked it up and ripped up the pages and threw them out the window. Then Bobby told me if I said anything, he would beat me up after school. PARENT: They did what} He kicked you}\ Didn’t the bus driver say anything? Who are these kids? I want their parents’ phone numbers. How dare they! Is this the same kid who ripped your backpack last month? I’m going to straighten him out! HE SHOULDN’T EVEN BE ALLOWED IN SCHOOL! THAT JERK IS GONNA PAY FOR THIS! This is the point when your kid decides it was a big mistake to say anything and vows never to open his mouth again. Instead, you could just say, “Were you hurt? Are you okay?” You can scream in the car, alone, later. 4. Use active listening techniques. One of the best ways to show a child you’re listening and understanding is to mirror back her feelings. Resist all urges to interrupt with pointed questions, advice, or blame. Instead, just sit there and listen and occasionally nod and interpret what feelings you think she’s expressing. For example, if she says, “No one let me play with them at recess today,” you could say, “Boy, you must have felt lonely.” If she says someone tripped her in the hall, you could say, “That must have been so embarrassing to you.” Then she can agree and let you know you’re on the right track—or disagree and correct you about how she really felt. (“I didn’t feel lonely. I felt mad!”) Remember, if you make a comment about her feelings or what you think she’s feeling, you’re on the right track! You don’t have to solve everything right now. Again, watch for cues. If your child is shutting down, repeating himself, getting over-emotional, losing focus, showing frustration, or not listening well, take a break. This is a weighty issue for your child, and he may be able to handle only a little bit at a time. Say something like, “Why don’t we take a break and talk some more later? We’ll come up with a plan and somehow we’ll find a way to help.” Always end on a hopeful note. I’m really proud of you for talking about this. I’m really proud of you for being so brave. I’m really proud of you for the way you handled yourself. I’m really proud of you for being mature. I’m really proud of you for trying out something new. I’m really glad you told me, even though it’s not easy to talk about.